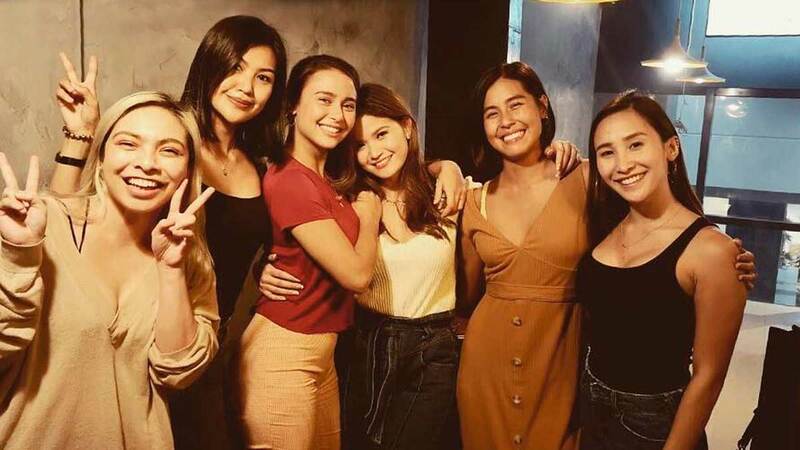 Yassi Pressman already transferred to ABS-CBN, but she remained in touch with her friends from GMA-7. The FPJ's Ang Probinsyano actress was present at the reunion of the defunct Kapuso variety shows Party Pilipinas and Sunday All Stars on Saturday, January 5. GMA-7 actors Rocco Nacino, Mark Herras, and former actor Steven Silva posted photos from their reunion on their Instagram accounts. Also present during the dinner were Winwyn Marquez, Kris Lawrence, Mayton Eugenio, and Jay-R.
Kapuso singer Frencheska Farr, who left show business to concentrate on her family life, also showed up at the reunion with her husband, Gino Jose. Rocco also brought along his girlfriend, Melissa Gohing, while Steven was with his girlfriend, Candy Gamos. According to Rocco and Mark's Instagram posts, they call their group "Tiki." Based on Rocco's Photoshopped post, also part of the group are Glaiza de Castro, Mark Bautista, Christian Bautista, Aicelle Santos, Gian Magdangal, Sef Cadayona, Maricris Garcia, Rodjun Cruz, Enzo Pineda, and Elmo Magalona. At present, Yassi, Jay-R, Gian, Enzo, and Elmo are signed with ABS-CBN. Yassi and Gian are co-stars in the prime-time series, FPJ's Ang Probinsyano. Rocco wrote in his caption, "First Tiki dinner for 2019! Glad to see everyone again and be able to catch up with one another!! And welcome back Maqui and Gino! We love you! Never a dull moment with the tikis!!! #TikiLove"
Steven's caption read, "So much love for this group. We BARELY see each other but when we do, it's like nothing's changed at all #Tikis #TikiReunion"
Party Pilipinas and Sunday All Stars were two of GMA-7's former Sunday noontime variety programs. Party Pilipinas aired from 2010 to 2013, while Sunday All Stars ran from 2013 to 2015.